Every year Doug carves pumpkins for friends. He has all the tools and loves every second of it. One year he convinced Tara and I to carve our own pumpkins. Several hours later we had both finished our last carved pumpkins. It was hard work! Last year Doug carved this pumpkin for Kirby's First Halloween. We combined these two patterns from Better Homes and Gardens - a Yorkshire Terrier and a Jack Russell. Pretty amazing if you ask me! This time we are going to take the new pattern and redraw the ears - Kirby's are somewhere between a droop and up which we think is one of his unique features. 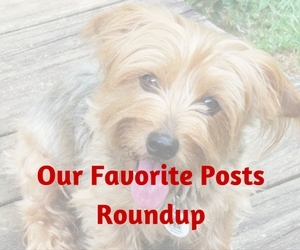 So far they have FREE downloadable patterns for 24 popular dog breeds. They also have FREE downloadable patterns for 14 different cat breeds and 3 mice. 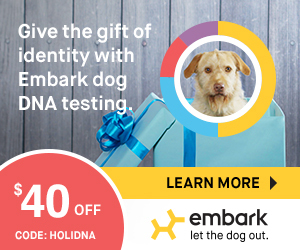 Don't see your particular breed? Then combine patterns like we did to create the image of your special buddy. 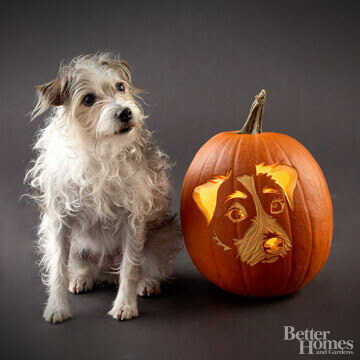 So spend an afternoon carving amazing pumpkins of your favorite four legged creature. Stores like Wal-Mart are filled with all the special tools you could possibly need to carve a masterpiece your friends will rave about. You can even reserve the scooped out pumpkin for a pie or some cookies. Hint, dogs love the taste of pumpkin. 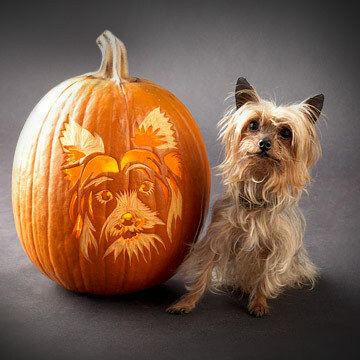 We would love to see pictures of your furry pumpkin master pieces!